I have enough tchotkes around my house to keep a cleaning lady busy for YEARS dusting. It's kinda a problem I have, you know throwing away (or giving away) stuff. Let's not talk about the years and YEARS of old magazines I have hoarded stored away. Back on subject, I get these items stuck in my head and I cant rest till I get what I'm looking for (I think this might have something to do with my hoarding problem too). Today I've been searching for some pretty green accessories tchotkes, I'll call a spade a spade and landed on some pretty cute ones over at Goodwill. None of them were exactly what I was looking for, but they are really cute and I wanted to share. All of these would be so lovely on a dresser with some jewelry, on a coffee table with some matchbooks, in the kitchen with candy...or just about anywhere you need a little color. You can find all these and more at Shop Goodwill online. PS- Speaking of shopping, don't forget to get your entry in for the Lily on Blue pillow giveaway. AND for 20% off any pillow in the store use the code LEB20OFF! 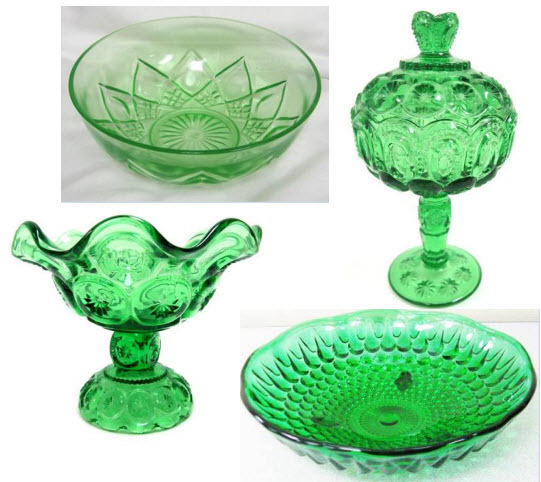 Ooooh I have the most fabulous green Blenko glass pitcher that reminds me of these items. It's such a dustcatcher but I will never part with it!! 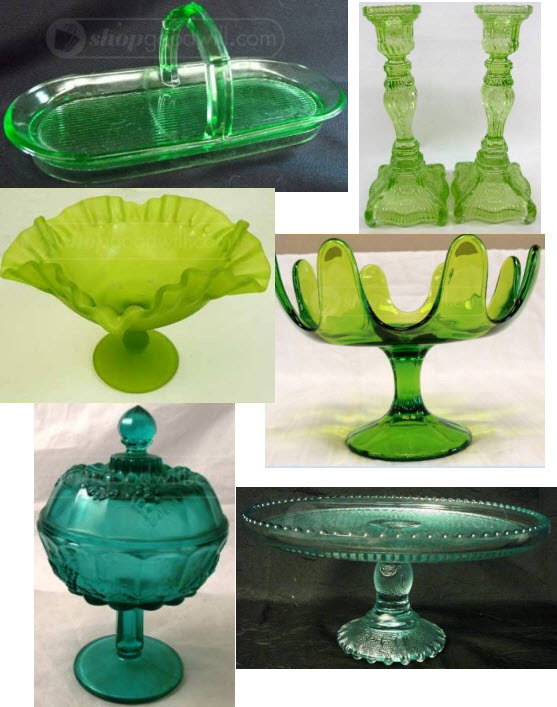 I love colored glass grouped into collections... green glass, in particular, looks so rich. How did I not know goodwill had an online ecommerce site? Guess you know what I'll be doing with my night! Lovely! I find that these colored glass pieces are often easy to find at flea markets and antique shops, too. I cringe to think of my CURRENT magazine stack waiting eagerly to be read, let alone the "archives". I too am one for beautiful trinkets, but fortunately for my wallet and lack of space in our apartment, the boy keeps it reeled in. My first thought was jewelry! It would look so pretty in that little green dish! My great grandma used to keep lays potato chips in a bowl just like the second to last one pictured. Thanks for the memory! !